I am super excited to share a new resource with you. I’ve been working with colleagues, Jennifer Lock and Meadow Schroeder, to develop an online tutorial to help graduate students in our school’s online and blended programs improve their knowledge about academic integrity. In 2017, we received a Scholarship of Teaching and Learning Grant from the University of Calgary to develop, test, and research the effectiveness of this online tutorial. What’s cool about this project is that until now, there has been very little support for students in our online and blended programs to access support. They’ve always had to come to campus to attend a face-to-face workshop. This tutorial represents a new era in supporting the success of online graduate students! The tutorial is housed within our learning management system. It is only accessible to students enrolled in graduate programs in the Werklund School of Education at the University of Calgary. Preventing Breaches of Integrity in Graduate Work. We are launching the tutorial this week, just in time for students who start their summer courses in July. We are excited about this project not only because it provides support to our online students, but also because we get to study how well the tutorial works because of the generosity of a research grant. I’ll keep you posted on how this project goes. Time to celebrate the launch of our tutorial! This blog has had over 2 million views thanks to readers like you. If you enjoyed this post, please “like” it or share it on social media. Thanks! I am excited to be teaching one of my favourite courses this summer: Language Learning and Technology (EDER 669.73). This is a course for our Master of Education students who are specializing in Teaching English as an Additional Language. One of the things I love best about this course is that students do a hands-on technology project instead of a final paper. This course has been designed for students who want to learn how to effectively incorporate technology in their present and future careers as language teachers. The course will cover both theoretical and practical issues in teaching second language and the use of new technology to support and enhance the learning process. A special emphasis will be on combining both face-to-face and the use of technologies in and beyond the classroom walls to enhance the second language learning process. Although the course may address the different types technologies such as Web 2.0 technologies (e.g., blogs, wikis; audio and video podcasting; online videos; mobile tools); mobile technology (e.g., mobile phones; MP3 players; digital cameras; camcorders), and other type of interactive technologies, the focus of the course is on the pedagogical and practical aspects of integrating new technology to face-to-face language teaching. The course is open to second language present and future teachers at the elementary, secondary, and post-secondary level. The course also invites language teachers with limited knowledge of the target language to learn how to enhance their language teaching by integrating blended teaching into their practice. The intent of this course is to explore the integration of technology to enhance language learning, particularly in in blended or distance environments. design and evaluate language-learning modules integrating digital technology for online or blended environments. Click here for a copy of the course outline. I know so many people who have started blogs, only to abandon them because they got too busy, got frustrated when they didn’t get a massive following instantly or just got bored. Of course, the stats for 2018 are lower because year isn’t half over yet. But if you look at 2010 through 2017, you can see that the number of individual views, as well as the number of visitors, has increased steadily over time. The graph below breaks it down a bit more. It shows how many views my blog has had over the months and years since I started it in February, 2010. Darker colours represent more views. The number of views has increased consistently over time. The average number of views per month in 2010 was under 1400. What I had as a monthly average number of views in my first year of blogging is now almost my daily average! Again, the numbers for June 2018 look low because that’s a monthly total and we’re still at the beginning of the month and that number is the average for the entire month. That number will increase throughout the month. Look at all the light grey in the first two years of my blog. The real increases started to show in year 3 (2012). If I had given up blogging, I would never have seen those increases. My lesson learned here is: Keep on blogging, even when you think no one is reading. More readers will stop by as your blog gets populated with content. There are some superstar bloggers out there who get millions of views every week. Some bloggers make money from their blogs, and others even blog for a living. But that was never my intention. 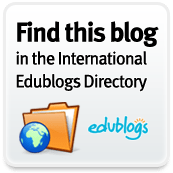 My goal with my blog has been consistent: to share and archive content, document my own professional and learning experiences and offer tips to students and educators. The number of views and visitors is relative to the industry you work in, your purpose for blogging and how much content you share. What happened that day? Nothing special, as far as I can tell. I didn’t even post that day. It was a complete fluke. I have no idea why that day in 2014 was my all-time daily maximum for blog views. My learning from this is to not get too hung up on trying to achieve every day. Progress happens over time. Blips and flukes happen, too. The important thing is to not give up and stick with it. I have tried all kinds of different things over the years. I’ve written features about educators who inspired me (like this post about Deaf educator, Brent Novodvorski, for example). In 2012, I did a weekly series where I posted my favourite resources of the week. I have also used my blog as a space to archive material that I wanted to share online with readers, like this APA Checklist for Term Papers. I have tried all kinds of different things over the years. My learning from this is that experimenting helped me to figure out what works. It also helped me to figure out what kind of blogger I want to be. I have worked as an educator since 1994. It’s no secret that I love teaching! I love interacting with students, whether they are in a classroom or online. While I may have been experimental with my posts at times, I’ve been consistent that my blog has always been focused on learning in one way or another. I don’t post recipes or tips to improve your health or fitness. I post about education. My followers have come to expect posts about learning, teaching, leadership or a related topic. My learning from this is to develop an identity as a blogger. I have grown and developed as both an educator and a blogger since I started my blog. I engage in regular reflection about what I have learned and what I still want to learn. For me, my professional growth and my development as a blogger have gone hand-in-hand over the past eight years. Some folks follow along on WordPress, others get an e-mail every time a post is published and still others follow along on social media. WordPress doesn’t give me much information about who these followers are, but all I can say is, “Thank you!” I appreciate that you have read, liked and commented (or even just lurked) over the years. It makes me feel that my blog with worthwhile to you. What better reward could there be? Regular followers will know that I shut down the comments section on my blog a few years ago. For a long time, I was really excited to get comments on my blog. But then, things took a dark turn once the blog started to really gain views. The nature of some of the comments sometimes became rude, aggressive or abusive. I expect that anyone who has spent a lot of time blogging has encountered something similar. I understand there are different thoughts on how to approach this. Some people believe that there’s no such thing as bad publicity and the more flaming comments, the better. Me, not so much. Ultimately, I decided to shut down the comments function. I still really appreciate it when people hit the “Like” button at the end of a post, but I’m not sure I’ll ever re-open the comments again. One highlight about developing my identity as a blogger and as a professional is that in 2010, the first year of my blog I wrote a post called, “Are your students plagiarizing? Here’s how you find out”. I wrote a few other posts about plagiarism over the next year. Several years later, academic integrity has developed into a major research area for me. In 2017, I published my first peer-reviewed research article on plagiarism. My learning from this is that your blog can be a place where your ideas germinate and incubate. I think those early posts in plagiarism in 2010 planted a seed that grew over the years. I am sorry to say that some of my best content has been replicated on other people’s blogs or sites without attribution to me. Of course this makes me sad and angry. I sometimes wonder if that experience was part of the reason my interest in plagiarism as a research interest developed? Not sure. I have learned the hard way that there are some people who feel entitled to lift whatever they want off the Internet and claim it as their own. My key piece of advice for bloggers is: Stick with it. Your blog is an expression of you and your ideas over time. Share whatever you want. Some people will love it and others won’t. That’s OK. If people leave you hurtful comments, turn off the comments. Your blog is about you and those who appreciate the effort you put into it. Experiment. Try different things. No blog is perfect, so don’t aim for perfection. Aim to be yourself and share whatever inspires you. Over time, I bet you’ll be surprised to see how you grow as a result. You are currently browsing the Learning, Teaching and Leadership blog archives for June, 2018.